Posztukiwania (english) | “Unoriginal” Leonardo? – part one. Home » Blog » “Unoriginal” Leonardo? – part one. 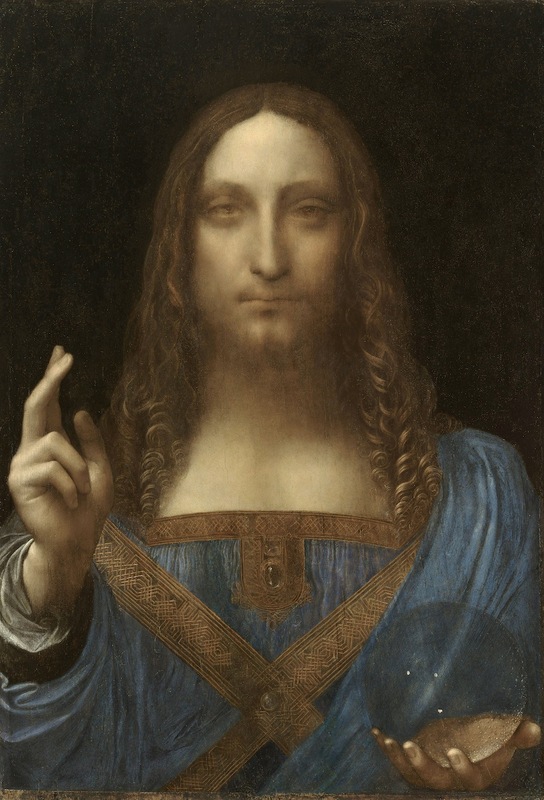 In November 2017 Christie’s in New York made a sale which has been a world record, selling a painting Christ Salvator Mundi (that is: Saviour of the World) for over 450 million dollars (!). The artwork went to Abu Dhabi and ended up in the Abu Dhabi Louvre museum. On his blog Art History News dr Bendor Grosvenor wrote: “I’ve been impressed by how Christie’s have marketed the picture – in fact, I’d say that they’ve taken marketing Old Masters to a whole new level.“. Indeed, Christie’s advertised the painting pretty well; they also published an article with a catchy title “The Last da Vinci” on their website. The text itself was not bad, but couple of sentences from it actually irritated me. I understand that nowadays everyone expects that the masterpiece by a famous artist is “original” and unique, and not only of a high artistic quality, but also original in composition. The article at the Christie’s website states, that: “The format follows the precedent of the ‘Christ Pantocrator’ (‘Ruler of All’ or ‘Sustainer of the World’) from Eastern Orthodox traditions, commonplace in religious imagery dating to Byzantine mosaics, although Leonardo’s Christ is portrayed as resolutely human — unusual at this time — lacking as he does a crown or a halo.” Next they write about the crystal orb, also indicating that depicting Christ’s orb as made of of rock crystal is somehow unique (“Leonardo here focused his unrivalled painting technique on conveying its transparency and convexity.”). These are the parts of the article that irritated me, as in fact the discussed Salvator Mundi simply follows a particular iconographic type, widely popular at the turn of the 15th and 16th century! The problem is that this type derived from Northern European art (Netherlandish, to be precise), and sometimes I have a feeling that the lovers of Italian art do not appreciate the idea that Renaissance artists may have been inspired by the Northern art, which is often categorised as late-gothic. 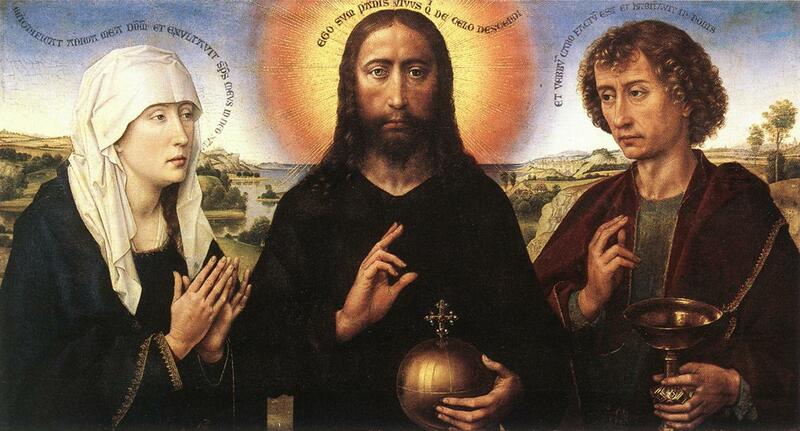 Most likely the type called Salvator Mundi was created in the Netherlands in the 15th century; scholars assume that the earliest surviving example is Christ from Braque Triptych by Rogier van der Weyden (ca. 1450, Louvre, Paris). It was a result of a fusion of two earlier types of depictions: Maiestas Domini (enthroned Christ blessing, usually in front view, holding a book) and the Holy Face (which emerged from the Veil of Veronica and the Image of Edessa). 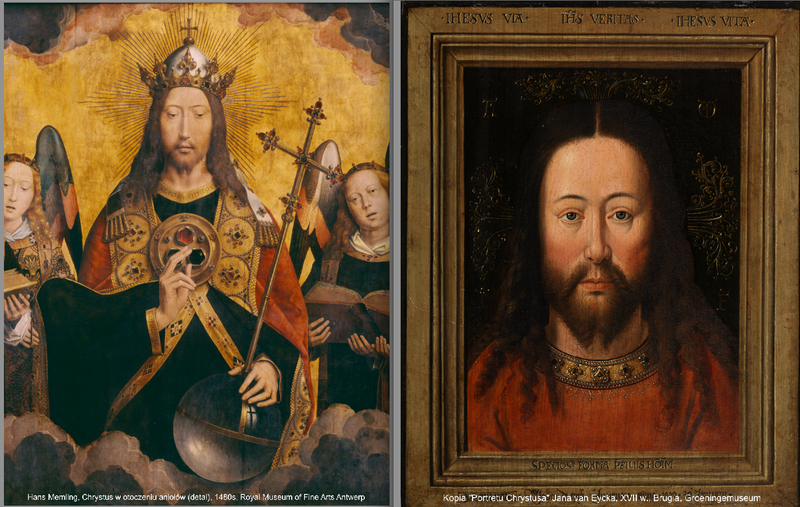 The latter was understood as a “true portrait” of Christ, depicting Christ in a frontal view, with no crown and in most cases showing only head and shoulders. Jan van Eyck’s workshop produced many such “portraits”. 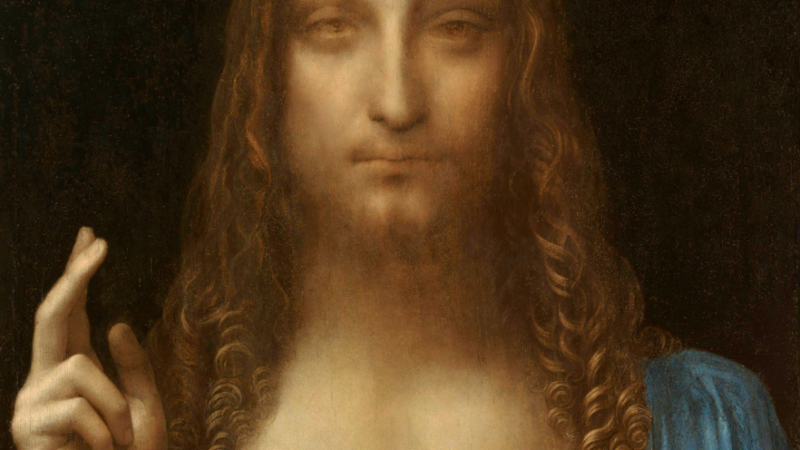 So, we could sum up here that Salvator Mundi was supposed to present both natures of Christ: God (as a ruler of the world, holding an orb) and human (depicted in an intimate frontal “portrait”). The orb in the 15th century may have beed depicted either as a metal globe or as a crystal sphere. Half-length image of Salvator Mundi was very popular in the Netherlandish painting of the second half of the 15th century, but it most likely derived from the full-length depictions. The prototype for those was probably the image of God creator of the world, depicted as Christ blessing the globe, which appeared in the Netherlandish illuminated Bibles ca 1400 (in the initial I at the beginning of Genesis). 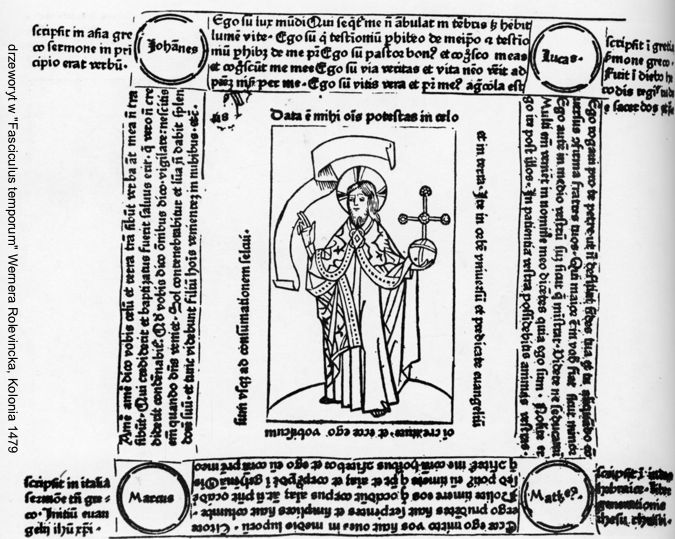 Those full-figure depictions of Salvator Mundi were lated much popularised by German prints, especially due to a great popularity of the text Fasciculus temporum by Werner Rolevinck (1425-1502), published many times since 1470s (until 1525 as many as 50 editions were released!). Considering the fact that there are quite many survived full-length depictions of Salvator Mundi in the Northern art of the second half of the 15th century, the scholars proposed that they all may derive from two lost Early-Netherlandish prototypes, coming from the workshops of Jan van Eyck and Rogier van der Weyden. The “eyckian” prototype may have depicted Christ dressed in a coat, and holding a crystal globe, perhaps with the image of the Earth inside. The prototype by van der Weyden, on the other hand, may have shown Christ dressed in a simple dark robe and holding a golden globe. These assumptions are based on analysis of the survived images that may have followed the hypothetical lost prototypes. 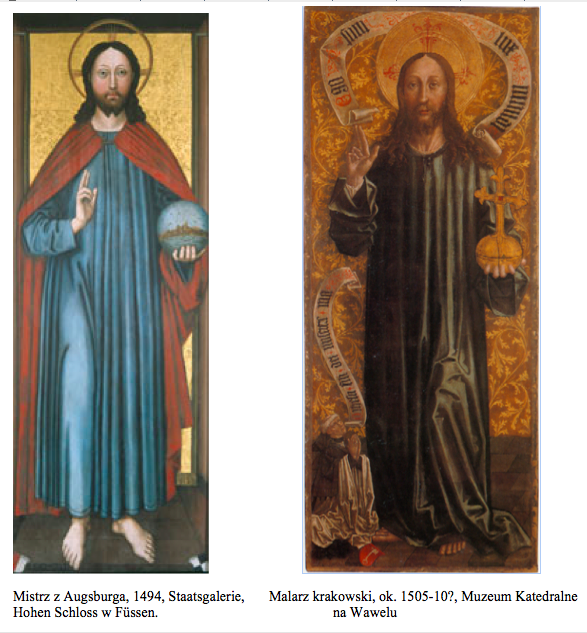 Those full-length depictions most likely were the sources of inspiration for simpler half-figure images, popular at the turn of the 15th and 16th centuries. First of all, Giotto is not 15th, but early 14th century, they really should know that! 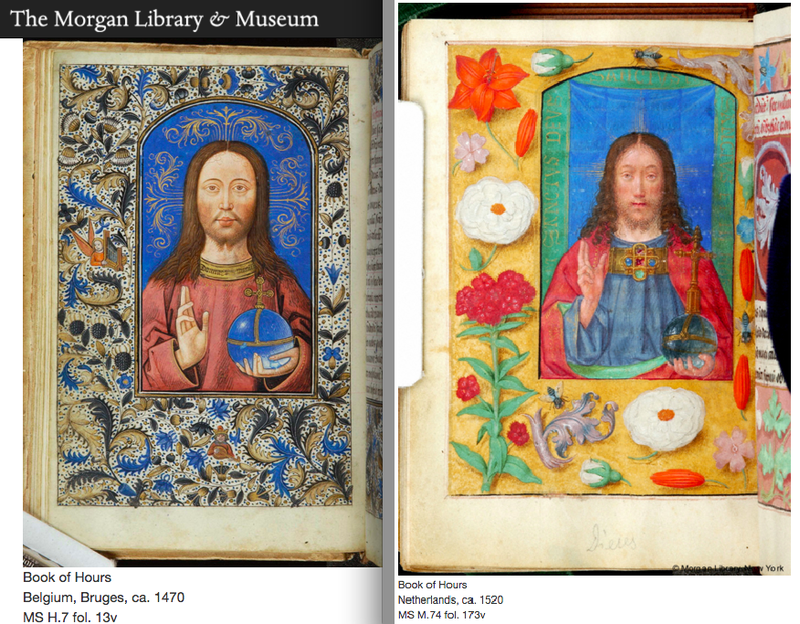 And second of all, blessing Christ holding a book of the early 14th century is not very likely as a direct source of inspiration for the image of Salvator Mundi ca 1500, considering the fact that by that time art market was full of actual “Salvators” – but to see it you need to look beyond Trecento artworks in the American collections. I really don’t think Leonardo would create his Salvator based on an old depiction of Christ in the 200-years old altarpiece, while he was surrounded by contemporary images of Salvator Mundi, appearing in panel painting, manuscripts and prints. But is the painting sold at Christie’s really by Leonardo? Well, that is a different issue, and most likely I will get back to it in the future posts.